As a child, I spent a lot of time playing tabletop games with family and friends. From the nearly universally reviled, yet still somehow popular Monopoly, to the card games like Yu-Gi-Oh, hours of my time were spent over a kitchen table. With the passage of time, however, things have changed. For many reason, I am no longer able to play these types of games as much as I want to. And like with most of my problems, I turned to the digital world for a solution. Over the years, I've played a lot of “virtual tabletop games” as a substitute. Despite being extremely similar, they are unique compared to their low-tech brethren in quite a few ways. 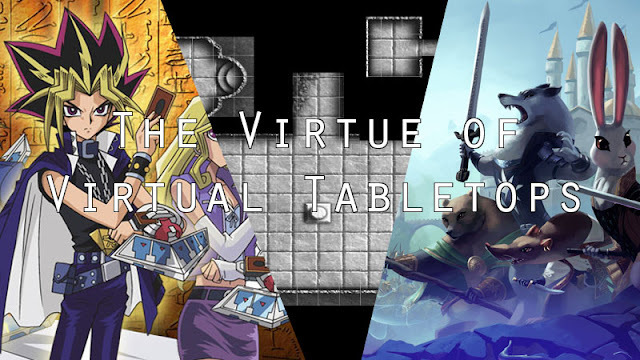 The most obvious of the differences is the ability to play online, on virtual tabletops. As we aged, the friends that I used to play games with grew apart. On top of that, many of those I am acquainted with today live in separate parts of the country, or even the world. Getting together in the same room to play with any of these guys is wildly impractical. However, it is possible to hang out virtually. Whether it's a large group playing an RPG-campaign through Roll20, a small gathering in a game of Armello, or just a friend and I on Dueling Network playing a children's card game, the physical distance that prevented in-person gaming has stopped being a concern. We can just get online, put a game on, and get on Skype, and we’re in for a pleasant evening together. Of course, even if my friends were closer and more able to get together, I could still see us using virtual tabletop games in lieu of physical games for the aid of the computer. One thing I notice, especially in tabletop RPGs, is that there are a lot of numbers, calculations, and other tedious aspects that can be difficult to keep track of. Depending on the game and the players, this can detract from the experience. Moving into the virtual space allows for much of this to be automated. With a computer keeping track of health, damage, resources, and equipment, I found it a lot easier to focus on the interactions and role-playing when my friends got together or an RPG session over Roll20. This made it much easier to just play the game and enjoy the time we all spent together. When tabletop games are brought into the virtual world, they can even make use of mechanics that would be completely impossible in meatspace. One of the most classic examples of this is the so-called “Fog of War” used in the X-Com games. If X-Com was a board game in real life, the player would have be able to see every single character and item on the field. However, because X-Com is a video game, it is able to conceal those elements. Every soldier the player commands has a range of sight, representing their visual range. The player can only see enemies and objects that are inside that radius. Everything else is hidden under the “Fog of War”. Armello also uses a variant of this mechanic to hide by allowing characters to be granted “Stealth”, making them invisible to other players under specific conditions. This type of obfuscation is just one example of what can be accomplished easily in the virtually, yet highly impractically when brought into the reality. Even though it's become wildly impractical for me to play the tabletop games I used to love as a child, the video games that bring them into the digital space have helped to fill that void. And in many cases, their virtual nature allows them to surpass their origins. There are still practical concerns that can't be avoided no matter how one plays, like arranging a time period to play with friends who all lead busy lives with hectic schedules. Still, playing virtual tabletops instead of actual tabletops reduces the barrier of entry into something more manageable when arranging play sessions with my friends.